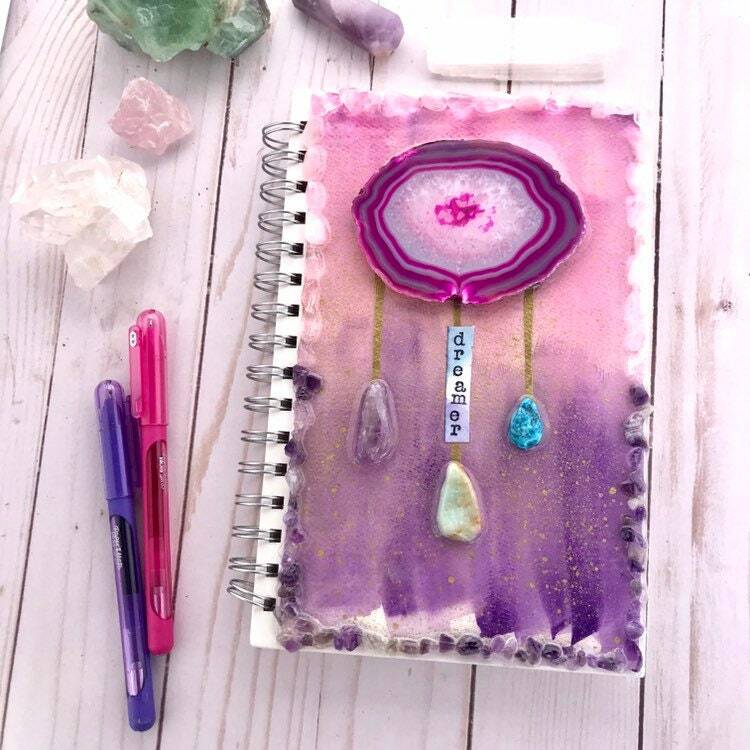 One of a kind dream journal with a unique work of art on the cover. Agate, amazonite, turquoise, amethyst, and water color, hand stamped “dreamer” all sealed in resin. The perfect place to jot down your dreams, visions and what you are manifesting in your life. Approximately 9 x 6 inches. Pen and crystals not included. You do amazing art pieces! I love the little stand it came with! I adore my dream art! Thank you! Super fast shipping! Absolutely stunning! And the stone goodie bag was an extra heart stopper. Thank you SO much! Love it! Super fast shipping! Absolutely gorgeous! And the stone goodie bag was an extra heart stopper. Over the moon grateful. immediate payment is expected at checkout. payment is accepted by credit card, paypal, and etsy gift cards. Each piece is hand painted and created by myself. If for some reason you are not happy with your purchase, contact me within 7 days of receiving your order and we will figure out how to solve the issue. Refunds and exchanges are on a case by case basis. I package everything very carefully! BUT, If your item is delivered damaged, send me a convo with a picture of the broken item, as well as the box that says "fragile" (this helps insure there are no issues when processing the insurance claim with USPS). Once I have received your photos, and confirm that I can claim insurance, I will remake your item and resend it at no charge to you. **This policy is only effective for 7 days after receiving your item. If I am contacted after the 7 day period, your item can no longer be returned. Ready to ship items will be mailed within 1-3 business days. Custom order production times are on a case by case basis depending on my current orders. Please send me a convo for more information. I recommend contacting me at least 4 weeks before you need the piece as my production time averages about 2-4 weeks depending on what the piece entails and my order volume.